The Cottage Project is under construction! In only a few weeks, eight homes have been placed on newly constructed foundations. Three additional foundations are currently underway, while Richard and I work to get the first eight move-in ready. 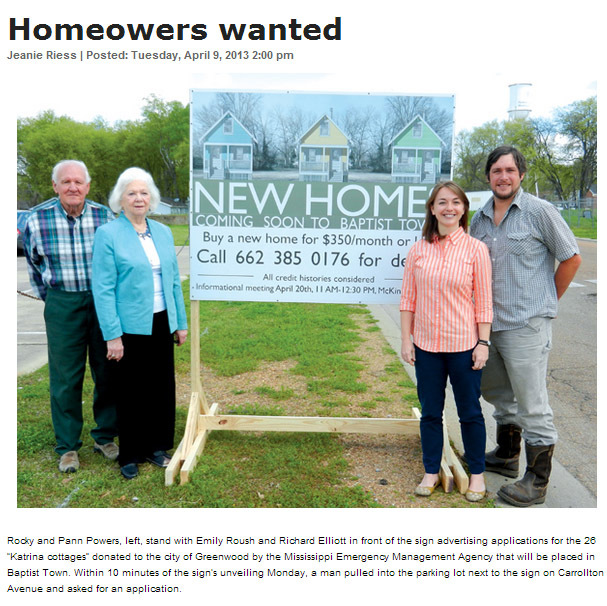 On March 17th, 2014 a piece of legislation was passed in the Mississippi State House of Representatives that will allow the project partners committed to bringing healthy, affordable homes to the Baptist Town neighborhood to move forward with the long-planned Mississippi Cottage initiative. 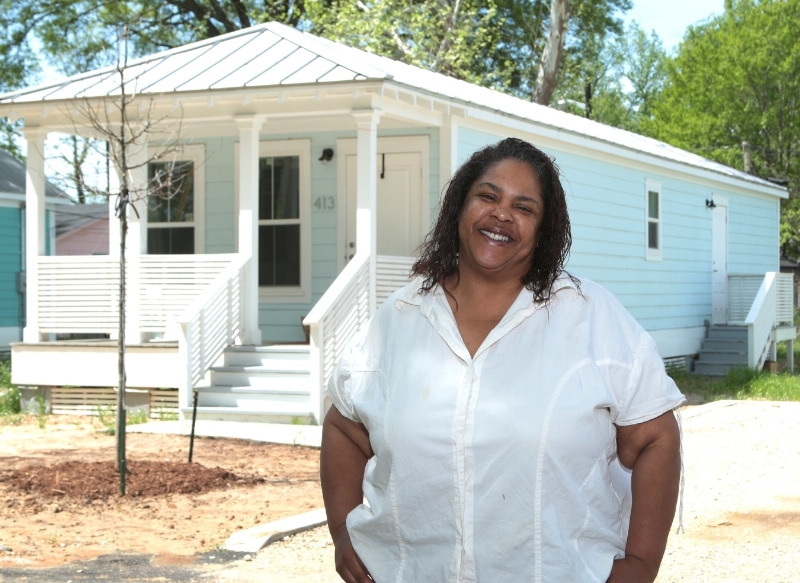 Through this effort, the Greenwood-Leflore Fuller Center for Housing (previously a Habitat for Humanity Chapter) will manage the construction and the mortgages for twenty-six Cottages that were donated to the City of Greenwood for use as affordable housing by the Mississippi Emergency Management Agency in 2011. Since the homes were donated, the project has encountered numerous unexpected complexities and hurdles (cataloged here). Despite setbacks, project partners, home-owner applicants, and Baptist Town neighborhood residents haven’t given up on seeing this much-needed effort come to fruition. With the passage of legislation that will allow the City of Greenwood to donate the homes to the local Fuller Center chapter, the project is now poised to be completed in 2014. Just as the project takes this exciting step forward, the Fuller Center Bike Adventure, an annual bicycle ride that incorporates a day of volunteer construction, came to Greenwood to build what else, but steps. During the Spring Ride (follow them on Facebook from March 14th-23rd), the thirty-three participants will ride over 350 miles in a week, raising funds and awareness about Fuller Center projects and programs. Included in this week is one build day, and the Greenwood-Leflore Fuller Center was honored to host the group here in Greenwood. These hard-working volunteers completed twenty kits of step parts, and assembled seven of them. Once the Cottages are installed on permanent foundations these steps will be attached. Many thanks to everyone who helped us kick off an exciting season of Cottage construction work! It has been a long time since I posted about the Cottages, donated to the City of Greenwood for use as affordable housing, and a big part of my fellowship work plan. This is because a resolution needs to be passed by the Mississippi legislature (typically in session from January through March) to allow the Cottages to legally end up in the hands of the organization that will install and sell them. As with many affordable housing projects, we have run into unexpected snags, policy that never predicted our specific circumstance, and skepticism. A recent letter to the editor of the Greenwood Commonwealth voiced some very real concerns about the homes regarding their durability, safety in regards to resident health, and cost. As I continue to build relationships with our legislators and we hopefully move closer to successful passage of our bill, this letter also provided me with an opportunity to publicly respond to these concerns. Below are some important facts about the cottages and this project that I highlighted in my response in a letter to the editor run on Sunday, February 9th, 2014. The Mississippi Cottages are high quality homes. They were designed not as temporary shelters, but as a way for Gulf Coast communities to build back better than they had been before Hurricane Katrina. I spent a significant amount of time in the homes while working in Biloxi, and I would not be dedicated to this project if these homes were not of a quality that I would live in one myself. From a technical standpoint, it should be clarified that the homes are “modular”, not “mobile”. This means that they conform to the highest building standards, and will meet all code requirements in any area of the United States. In regards to finances, the Cottages themselves were donated, but the land on which they will sit, their foundations, driveways, steps, and mechanical, electrical and plumbing connections were not. These items combined will cost an estimated $25,000 for a two-bedroom Cottage. Pending passage of a bill currently in the MS legislature, the Fuller Center will sell the homes to applicants for only the costs that they invest in the items listed above. The mortgage the Fuller Center will offer will be for 15 years with 0% interest. It is our projection that the actual per month cost will be approximately $120-$160 in mortgage principal payment plus $60-$120 in monthly payments for insurance and property taxes. Many thanks to Jeanie Riess, a great writer for our local paper, who covered the unveiling of our new sign and ran this image and caption in the Greenwood Commonwealth today. I have had more than a dozen phone calls already from interested applicants, and two completed applications submitted. Thanks to Jeanie and everyone supporting this project!